The Crown of Louis XV is the sole surviving crown from the French ancien regime among the French Crown Jewels. The crown was created for King Louis XV in 1722, when he had a new crown created. It was used at his coronation and was embellished with diamonds from the Royal Collection. The new crown was made by Laurent Ronde, the French Crown jeweller. It originally contained a collection of Mazarin Diamonds, the Sancy diamond in the fleur-de-lis at the top of the arches, and the famous 'Regent' diamond, which was set in the front of the crown, as well as hundreds of other precious diamonds, rubies, emeralds and sapphires. All of France's about 20 crowns of the Ancient Regime, kept in the Basilica of Saint-Denis, including the one of Saint Louis and the one said of Charlemagne, were destroyed in 1793 during the French revolution. The crown of Louis XV was the only one to survive and counts, with those of the 19th century, among the only six remaining French crowns. In 1885 the French Third Republic decided to sell the Crown Jewels. Given its historic importance, the crown of Louis XV was kept, though its precious stones were replaced by glass. It is on permanent display in the Louvre museum in Paris. The Louvre, or the Louvre Museum, is the world's largest art museum and a historic monument in Paris, France. A central landmark of the city, it is located on the Right Bank of the Seine in the city's 1st arrondissement. Approximately 38,000 objects from prehistory to the 21st century are exhibited over an area of 72,735 square metres. In 2018, the Louvre was the world's most visited art museum, receiving 10.2 million visitors. Crown Jewels are the objects of metalwork and jewellery in the regalia of a current or former monarchy. They are often used for the coronation of a monarch and a few other ceremonial occasions. A monarch may often be shown wearing them in portraits, as they symbolize the power and continuity of the monarchy. Additions to them may be made, but since medieval times the existing items are typically passed down unchanged as they symbolize the continuity of the monarchy. A crown is a traditional symbolic form of headwear, not hat, worn by a monarch or by a deity, for whom the crown traditionally represents power, legitimacy, victory, triumph, honor, and glory, as well as immortality, righteousness, and resurrection. In art, the crown may be shown being offered to those on Earth by angels. Apart from the traditional form, crowns also may be in the form of a wreath and be made of flowers, oak leaves, or thorns and be worn by others, representing what the coronation part aims to symbolize with the specific crown. In religious art, a crown of stars is used similarly to a halo. 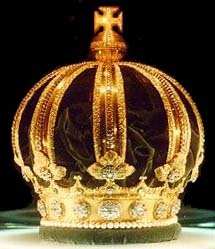 Crowns worn by rulers often contain jewels. A tiara is a jeweled, ornamental crown traditionally worn by women. It is worn during formal occasions, particularly if the dress code is white tie. The Crown Jewels of the United Kingdom, originally the Crown Jewels of England, are 140 royal ceremonial objects kept in the Tower of London, which include the regalia and vestments worn by British kings and queens at their coronations. The French Crown Jewels comprise the crowns, orb, sceptres, diadems and jewels that were symbols of Royal power between 752 and 1825. These were worn by many Kings and Queens of France. The set was finally broken up, with most of it sold off in 1885 by the Third French Republic. The surviving French Crown Jewels, principally a set of historic crowns, diadems and parures, are mainly on display in the Galerie d'Apollon of the Louvre, France's premier museum and former royal palace, together with the Regent Diamond, the Sancy Diamond and the 105-carat (21.0 g) Côte-de-Bretagne red spinel, carved into the form of a dragon. In addition, some gemstones and jewels are on display in the Treasury vault of the Mineralogy gallery in the Muséum national d'histoire naturelle. The Austrian Crown Jewels is a term denoting the regalia and vestments worn by the Holy Roman Emperor, and later by the Emperor of Austria, during the coronation ceremony and other state functions. The term refers to the following objects: the crowns, sceptres, orbs, swords, rings, crosses, holy relics, and the royal robes, as well as several other objects connected with the ceremony. The collection dates from the 10th to the 19th centuries and reflects more than a thousand years of European history. It is kept at the Imperial Treasury in the Hofburg Palace in Vienna, Austria. The Iranian National Jewels, originally the Iranian Crown Jewels, include elaborate crowns, thirty tiaras, and numerous aigrettes, a dozen bejeweled swords and shields, a number of unset precious gems, numerous plates and other dining services cast in precious metals and encrusted with gems, and several other more unusual items collected or worn by the Persian monarchs from the 16th century on. 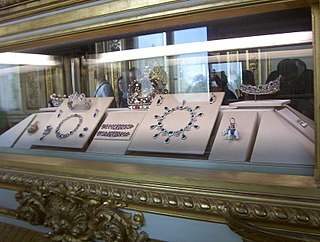 The collection is housed at The Treasury of National Jewels. It is situated inside the Central Bank of Iran on Tehran's Ferdowsi Avenue. The museum is open to the public from 14:00 to 16:30 hrs except on Wednesday, Thursday and Friday. The museum has onsite guides with knowledge of Persian, English, French and Russian languages. There are also guide booklets available in English, Persian, French, Russian, German, Japanese and Arabic. The Crown of Charlemagne was a name given to the ancient coronation crown of Kings of the Franks, and later Kings of France after 1237. The Crown of Napoleon was a coronation crown manufactured for Napoleon and used in his coronation as Emperor of the French on December 2, 1804. 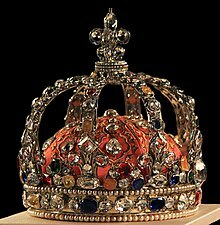 Napoleon called this crown the "Crown of Charlemagne", which was the name of the ancient royal coronation crown of France that had been destroyed during the French Revolution. This name allowed Napoleon to compare himself to the famed mediaeval monarch Charlemagne, King of the Franks and Holy Roman Emperor. The Regent Diamond is a 141-carat (28.2 g) diamond owned by the French state and on display in the Louvre, worth as of 2015 £48,000,000. It is widely considered the most beautiful and the purest diamond in the world. The manufacture nationale de Sèvres is one of the principal European porcelain manufactories. It is located in Sèvres, Hauts-de-Seine, France. It is the continuation of Vincennes porcelain, founded in 1738, which moved to Sèvres in 1756. It has been owned by the French crown or government since 1759, and has always maintained the highest standards of quality. Almost immediately, it replaced Meissen porcelain as the standard-setter among European porcelain factories, retaining this position until at least the 19th century. The Imperial Crown of Brazil, also known as the Crown of Dom Pedro II or as the Diamantine Crown, is the Crown manufactured for the second Brazilian Emperor, Pedro II. The Louis XV style or Louis Quinze is a style of architecture and decorative arts which appeared during the reign of Louis XV of France. From 1710 until about 1730, the period known as the Regency, it was largely an extension of the "Style Louis XIV" of his great-grandfather and predecessor, Louis XIV of France. From about 1730 until about 1750, it became more original, decorative and exuberant, in what was known as the rocaille style, under the influence of the King's mistress, Madame de Pompadour. It marked the beginning of the European Rococo movement. From 1750 until the King's death in 1774, it became more sober, ordered, and began to show the influences of neoclassicism. Like many other monarchies, the Russian Empire had a vast collection of regalia belonging to the Tsars. This collection is now on display in Kremlin in Moscow. The Diamond Fund maintains the security of the greater diamond masterpieces. La Pelegrina pearl is one of the most famous pearls in the world. Its history spans more than 350 years, and it has survived both the French Revolution of 1789–99 and the Russian Bolshevik (Communist) revolution of 1917. It was owned by European kings and queens. The Portuguese Crown Jewels were the pieces of jewelry, regalia, and vestments worn by the Monarchs of Portugal during the time of the Portuguese Monarchy. Over the nine centuries of Portuguese history, the Portuguese Crown Jewels have lost and gained many pieces. Most of the current set of the Portuguese Crown Jewels are from the reigns of King João VI and King Luís I. The Mirror of Great Britain was a piece of jewellery that was part of the Crown Jewels of the United Kingdom during the reign of James I of England and VI of Scotland.